The TrafficMASTER Island Sand Beige 16 in. x 16 in. Ceramic Floor and Wall Tile has a P.E.I. Rating of III, which means it is suitable for medium-duty residential floors, including kitchens, halls, corridors, balconies, terraces and areas used with normal footwear and small amounts of dirt. 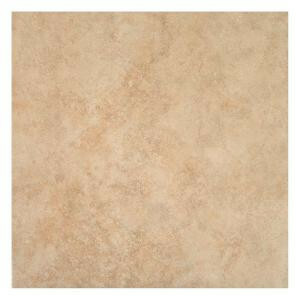 Featuring an attractive beige color, the semi-vitreous glazed tile is moderately slip resistant. 15.5 square feet, 9 pieces per case. Case weight is 54 lbs. Buy online TrafficMASTER Island Sand Beige 16 in. x 16 in. Ceramic Floor and Wall Tile (15.5 sq. ft. / case) UE4L, leave review and share Your friends.